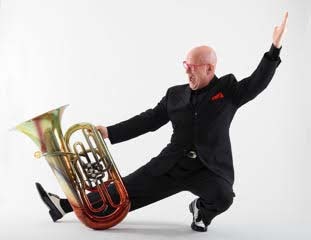 The Scottsdale Concert Band will conclude its 40th season with a free concert at 3:30 p.m. on Sunday, May 6, titled “Windows of the World” and featuring renowned tuba soloist Patrick Sheridan. The concert will take place at Chaparral High School, 6935 E. Gold Dust Ave., Scottsdale. Sheridan is one of the most celebrated soloists in his instrument’s history. He has performed more than 3,000 concerts in over 50 countries in venues ranging from the White House to NBA half-time shows to the Hollywood Bowl. At 20 years of age, Sheridan became a member of “The President’s Own” United States Marine Band. During his military service, he thrilled audiences across the United States with his amazing virtuosity and musicianship as one of the band’s primary soloists. The Scottsdale Concert Band, a 75-member community ensemble, directed by Michele Kalo, is sponsored by Scottsdale Community College and performs four concerts per year. For more information about the band and to hear recordings from previous concerts, go to www.scottsdaleconcertband.org, or call Michele Kalo, (602) 327-3168.